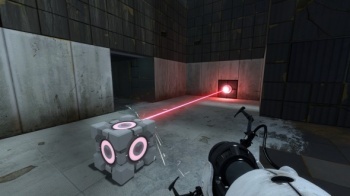 Valve has clarified the Steam features coming to the PlayStation 3 version of Portal 2, which include a free PC copy of the game. Valve first revealed that Steam would be coming to the PlayStation 3 along with Portal 2 back at E3 2010. A recent press release has detailed every feature that's coming along with it. Portal 2 might be the first title to support Steam on a console, but it's starting off with a rich feature set. PlayStation Network users will first link their PSN accounts with their Steam accounts through the game. New users can also create a Steam account right there if necessary. Once linked, a Steam overlay will give access to both Steam and PSN friend lists at the same time, allowing players to chat and check friend statuses. Most importantly, players will be able to engage in cross-platform play (between PC and PS3) in Portal 2's co-op mode. PSN trophies and Steam achievements will also be earned at the same time. Steam functionality will save both co-op games and single-player games online in the Steam Cloud so players can continue their game on any PS3, though Valve doesn't mention being able to go from a PS3 to a PC. As previously announced, Valve is doing gamers a solid by giving Portal 2 PS3 buyers a free copy of the PC version on Steam. An in-box code redeemed on a computer will add the game to a Steam library. Some may have once considered the PS3 a waste of time, but Sony at least allowed Valve to create some sweet cross-platform functionality here. Steam isn't coming to the Xbox 360 version of Portal 2 because of what is likely a conflict of interest for Microsoft. For more specific information, check out the Steam Knowledge Base for Portal 2 on PS3 here. Portal 2 will be available for the PS3, Xbox 360, and PC on April 19, 2011, unless a certain ARG rumor comes true.